Researchers have designed a new type of laser called a quantum dot ring laser that emits red, orange, and green light. The different colors are emitted from different parts of the quantum dot—red from the core, green from the shell, and orange from a combination of both—and can be easily switched by controlling the competition between light emission from the core and the shell. The researchers, Boris le Feber, Ferry Prins, Eva De Leo, Freddy T. Rabouw, and David J. Norris, at ETH Zurich, Switzerland, have published a paper on the new lasers in a recent issue of Nano Letters. The work demonstrates the interesting effects that are possible with lasers based on quantum dots, which are nanosized crystal spheres made of semiconducting materials. In these lasers, the quantum dots are often coated with shells of a different material. When illuminated, the shells not only emit light of their own, but they also channel photoexcited carriers (excitons) to the cores of the quantum dots, which enhances the laser's core light emission. In order to make quantum dot lasers that can switch between emitting light from only the cores or only the shells, the researchers designed a special laser cavity, which is the central part of the laser responsible for confining and reflecting light until it becomes highly coherent. Although quantum dot lasers have been widely researched, the effect of the laser cavity on quantum dot laser performance has been largely unexplored until now. In the new study, the scientists fabricated high-quality laser cavities made of arrays of highly structured quantum dot rings. The resulting lasers exhibit very high cavity quality factors—almost an order of magnitude higher than those of typical quantum dot lasers, which usually have random cavities. 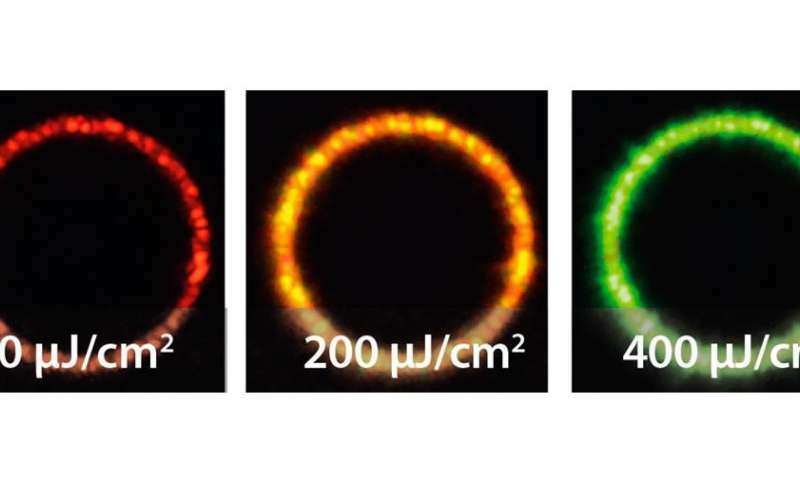 "We were able to demonstrate a simple fabrication approach that led to high-quality ring cavities that allowed us to explore this 'color switching' behavior in a quantum dot laser," Norris, Professor of Materials Engineering at ETH Zurich, told Phys.org. "In poor-quality cavities it is unlikely that we would have been able to observe this effect." The researchers demonstrated that, at low powers, the new lasers emit red light from their cores, whereas at higher powers, they emit green light from the shells. At intermediate powers, the light comes from both the core and shell, and so appears orange. As the researchers explain, it's possible to completely stifle core emission because the core emission takes place on a picosecond timescale, while shell emission occurs on a subpicosecond timescale and so can greatly outpace core emission, as long as the laser power is sufficiently high. In the future, the unique properties of the quantum dot ring lasers may lead to applications in laser displays, chemical sensing, and other areas. But before these applications can be realized, the researchers plan to further improve the laser's performance. "We demonstrate the 'color switching' effect in this work, but the color change occurs at very high powers," Norris said. "Further research is required to see if the same effect can occur at more reasonable powers. This would be useful for applications. Fortunately, quantum dots continue to improve (in terms of their performance for lasers), and we can immediately apply these improvements to our devices." If they can manage to tweak it into providing a blue color, that would be all that is needed for the next generation of displays.